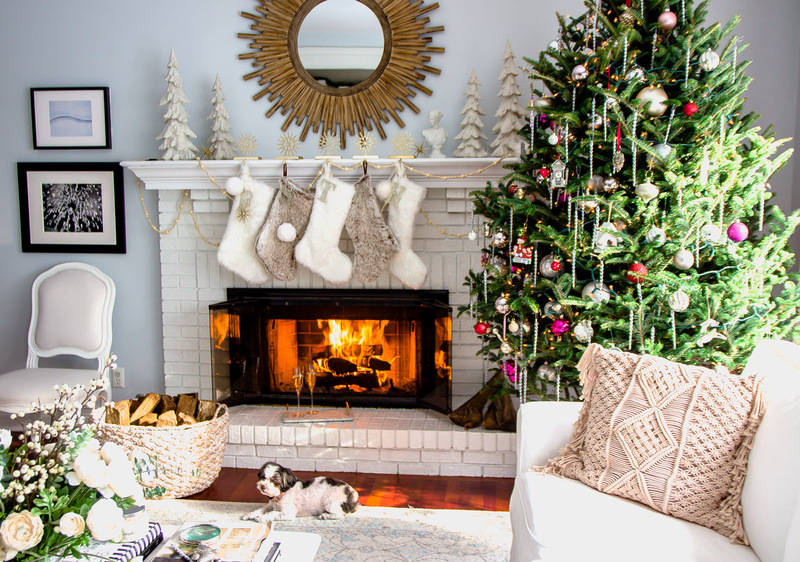 I’m so excited to share our home today ~ all dressed up for the holidays! 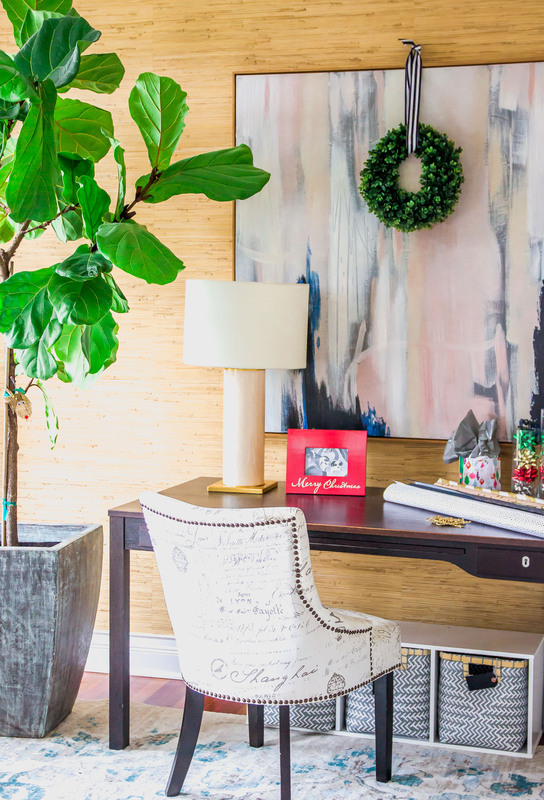 I’ve teamed up with a very talented group of bloggers to share our homes for the holidays! Be sure to check out the links at the bottom to their tours as well for more inspiration. I’m incredibly honored to be a part of such a talented group of ladies! This year, we welcomed our 3rd daughter, Harper to our family. 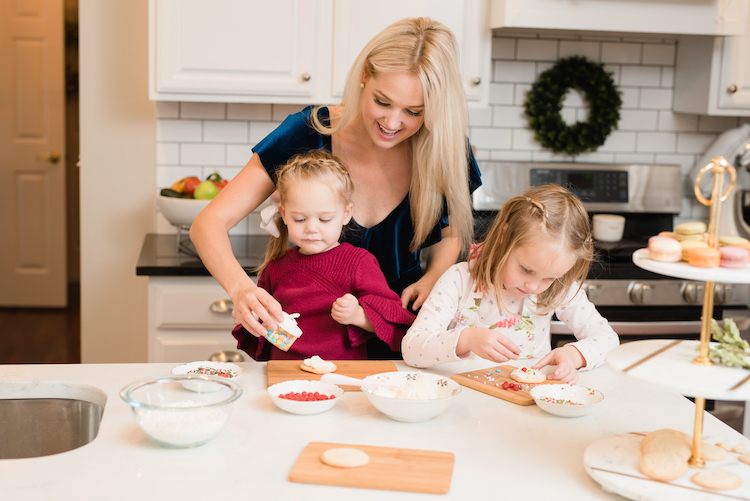 Kids definitely make the holidays more fun and we have been having a lot of fun around here. 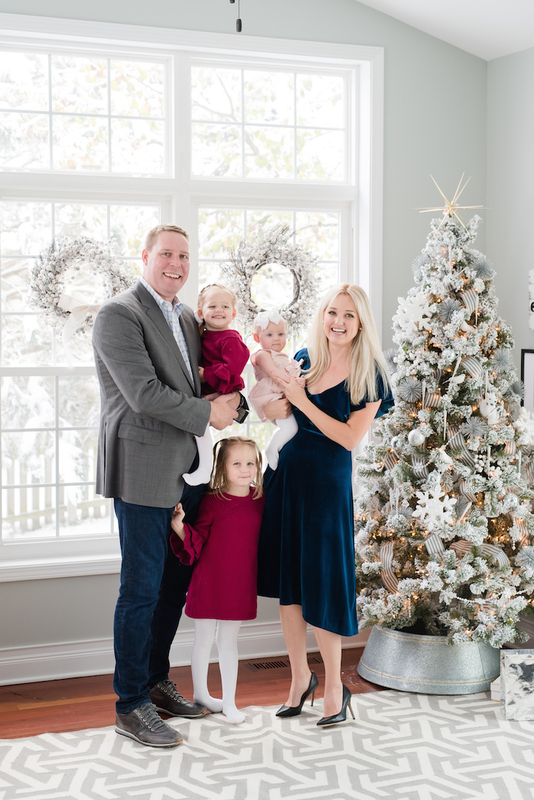 Which is great for us, but I’ll admit I had to work extra hard this year to get photos of our house in a “blog” worthy state!!! 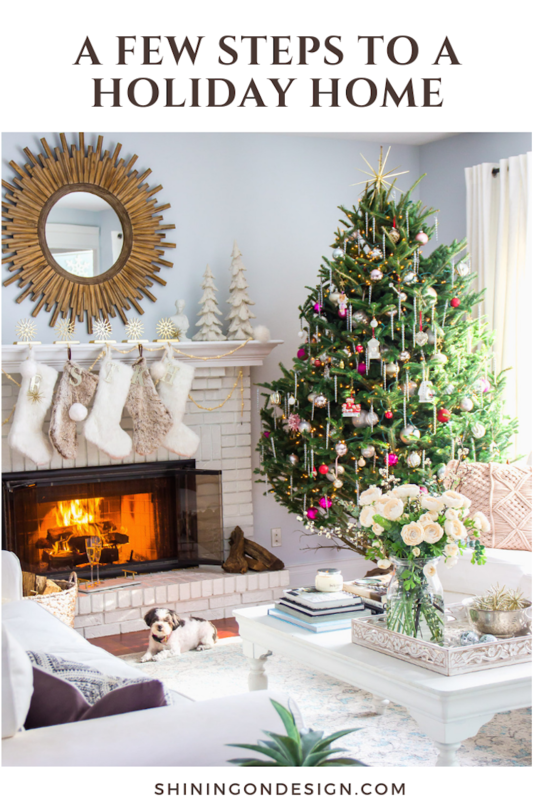 I do love decorating for Christmas and I do hope that our home inspires you for your decorating this year. I hope you guys know that our home almost never looks like this. Toys, dishes, laundry piles are probably all behind the camera (some probably made it in the shots too if you close enough!). Please don’t look that close haha! 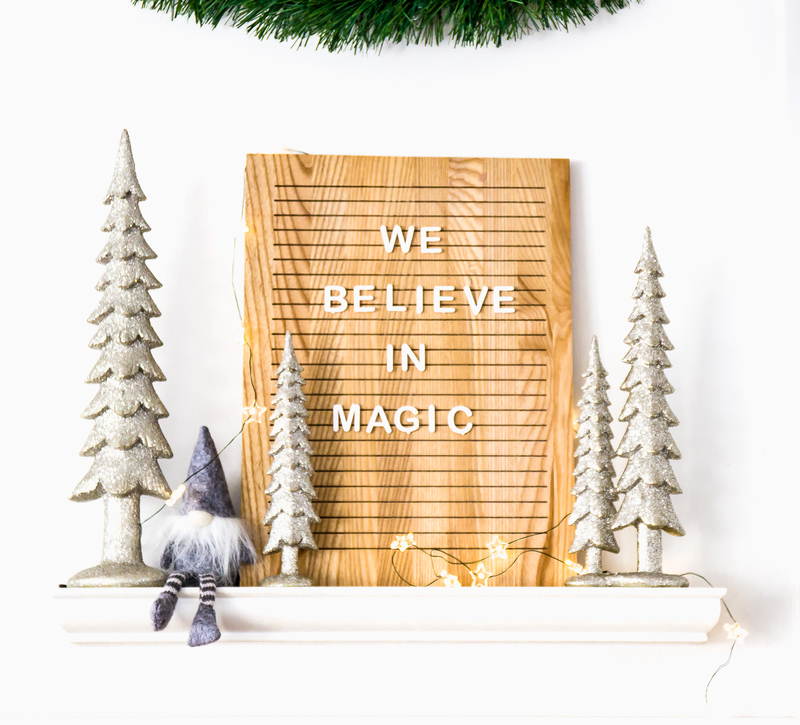 I wanted our decor to feel whimsical for the kids but with a grown up feel. 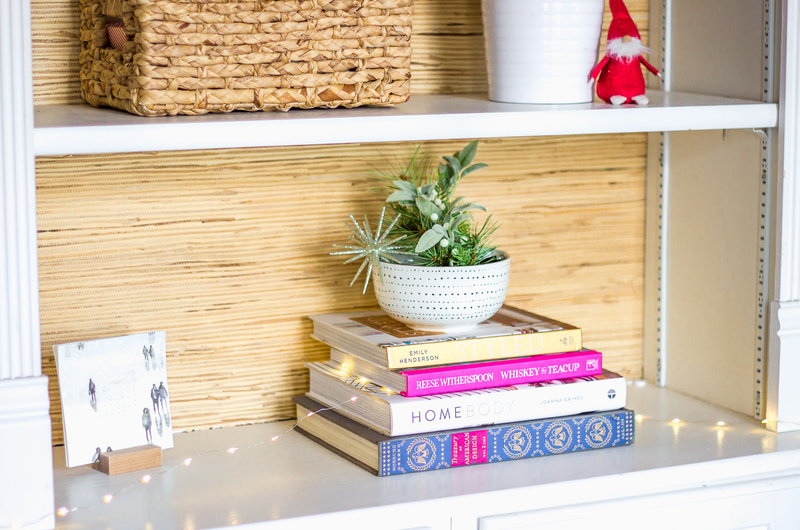 I added a lot of twinkly lights around the house and focused on simple, festive touches. Let’s start with our living room, since this is where we spend most of our time! The artwork is my favorite recent addition to this room. The top print is a snowy Gray Malin and the bottom chandelier photo is an iphone shot from a special vacation! We have a mix of artwork in our home and my favorite pieces are the ones that bring back memories. Tip: use pages from books for easy and affordable artwork! My favorite is Gray Malin’s Escape book. This also makes a great gift! Our tree in our living room is real and it’s where we hang all our family ornaments. For every milestone, my mom gets us a Waterford ornament (new house, wedding, babies, etc.). I also started buying the girls one special ornament every year. Hanging those are the best part of getting our home holiday ready. I added lots of icicles this year too! 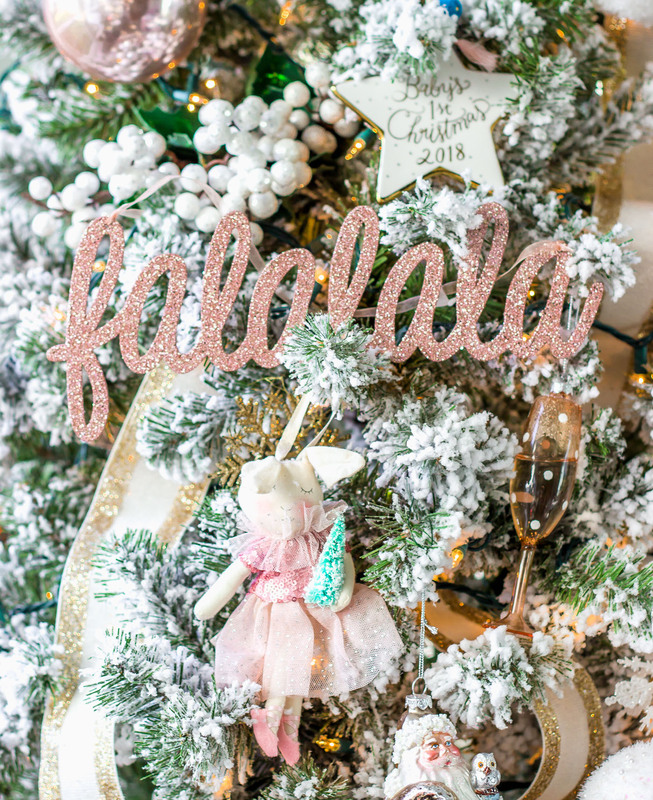 Disco Ball ornaments are magical! 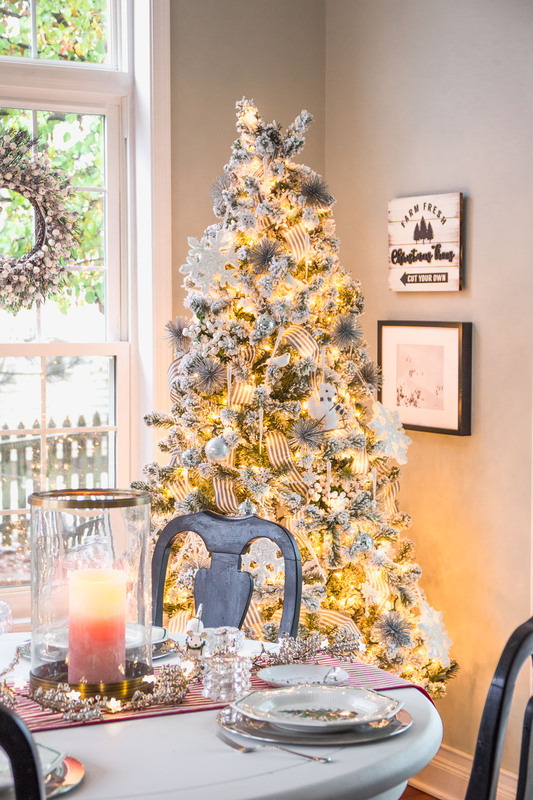 When the sunlight is right, these disco ball ornaments light up the entire room! It’s pretty magical. I’ve had these ornaments for years and I love that our kids get to enjoy how they sparkle in the light. I’ll try to get a photo of this to share! I also “winterfied” our floral centerpiece by adding white berry stems and real eucalyptus. 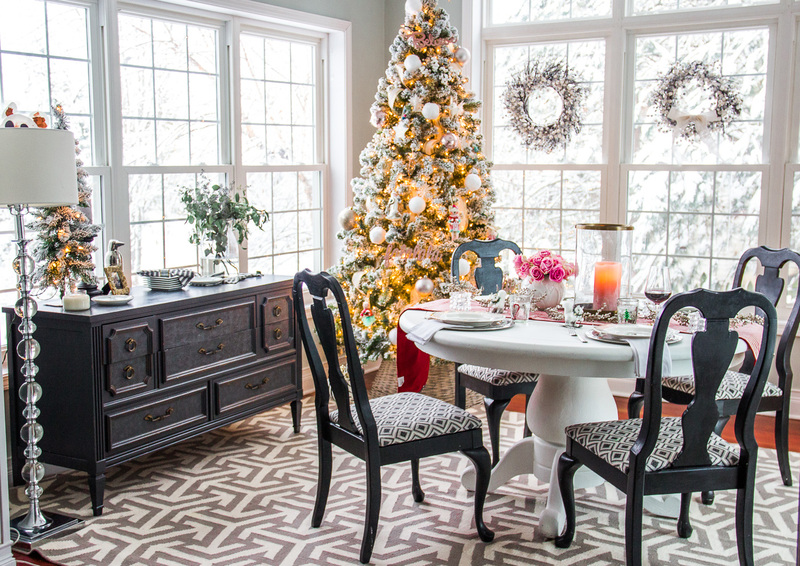 Next, up: our sunroom, turned dining room for the season! 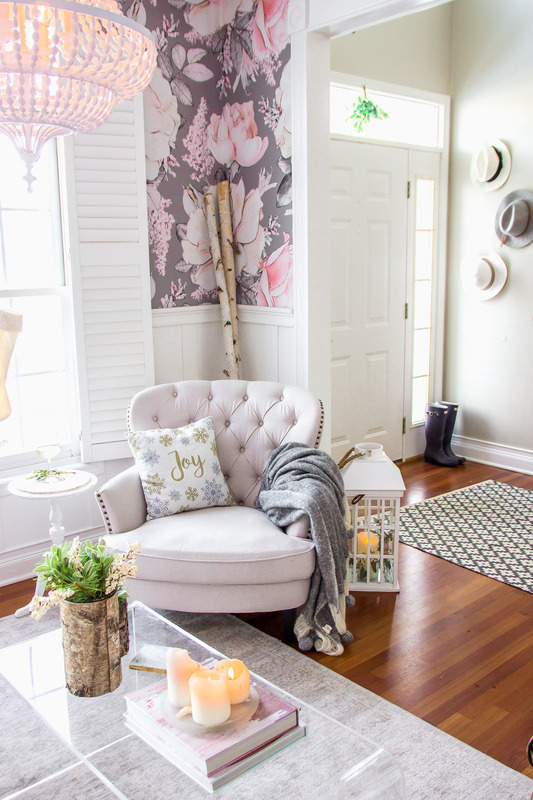 My favorite room in our home! 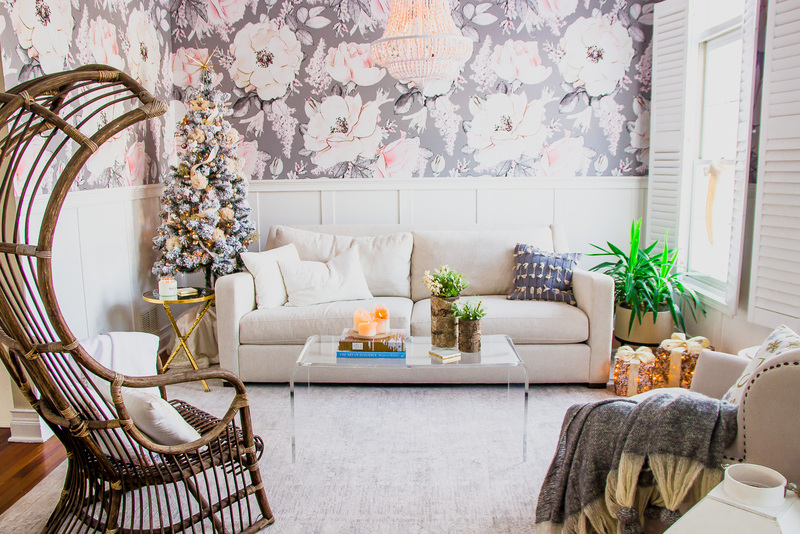 We’re hosting a few gatherings this season so we decided to do a “room swap”. Our sunroom furniture is in our dining room, and vice versa. The flocked Christmas trees are new this year too. They are from King of Christmas (ps. worth all the hype.). Also, I just learned the secret behind putting ribbon on your tree easily. Cutting strips into 12-18″ pieces and tucking them throughout. Voila! I kept our tablescape pretty simple for this years house tour. 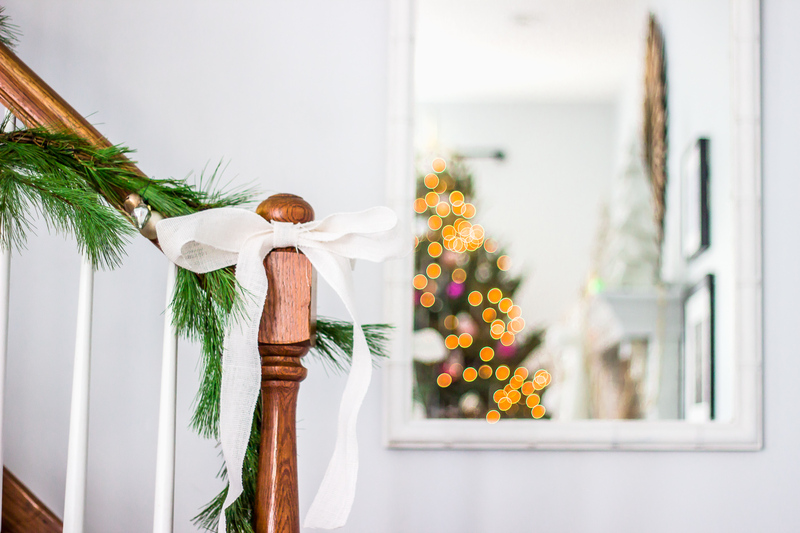 A red and white striped runner, twinkling lights, garland, candles and my grandmothers dishes. Found another spot to add wintery artwork! 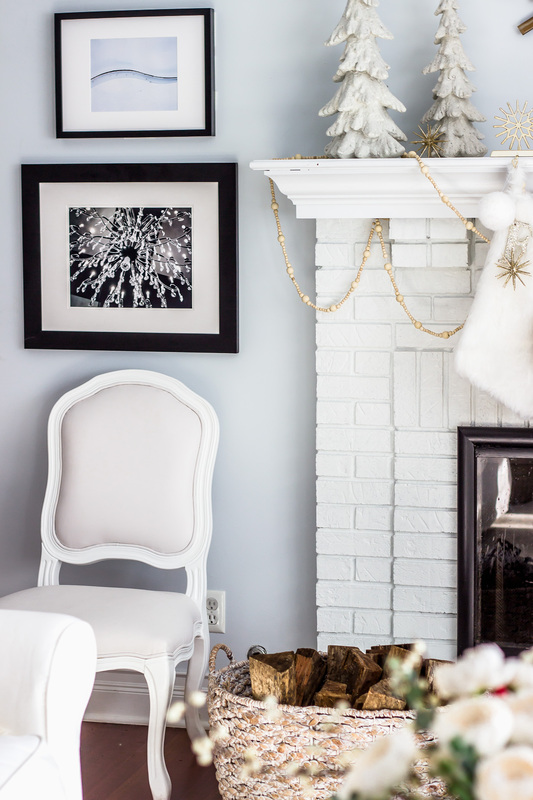 The print is another Gray Malin (his snow collection is perfect for winter) and the Christmas tree wall decor is from Third and Main (a home decor subscription company). This is the second place that I stacked pieces of different sizes and I love how it turned out! I also used ikea frames and took out the plastic / glass so they look much nicer. I hung them with command strips to make it easy and removable. 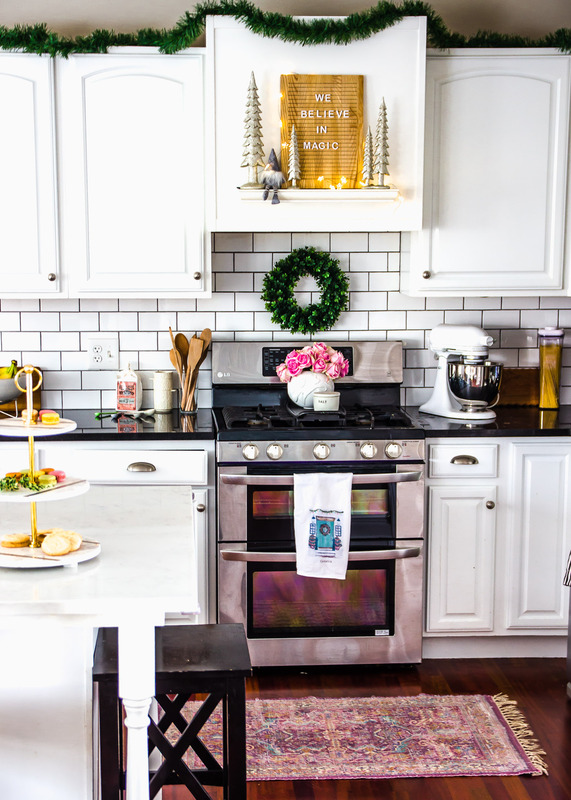 A few holiday touches in our kitchen…. 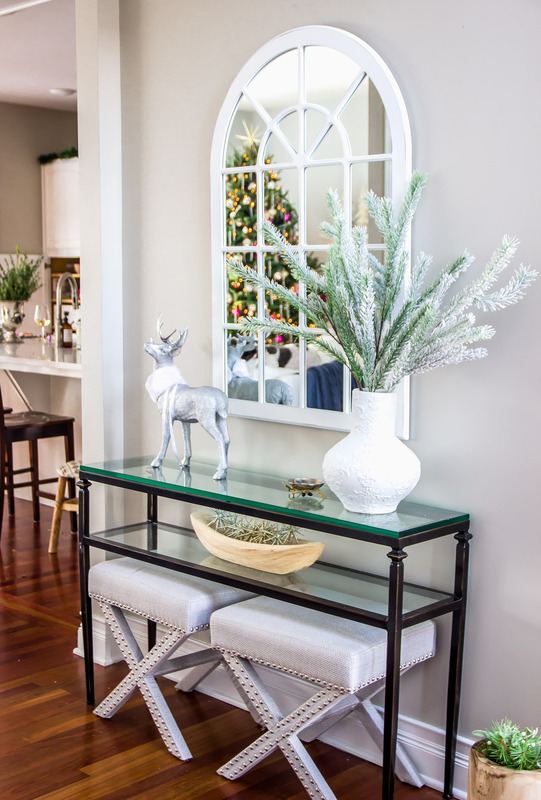 A little simple holiday styling for this console table off our entry. My goal is to keep everything simple these days! 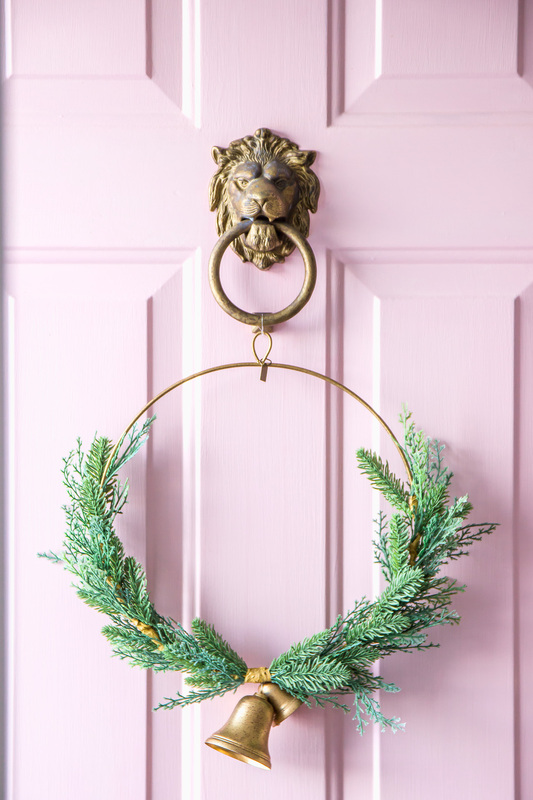 I did very little shopping this season but I was glad I bought these snowy pine branches (currently on sale!). I have 4 total in this vase. Throughout the house, I have vases year round. 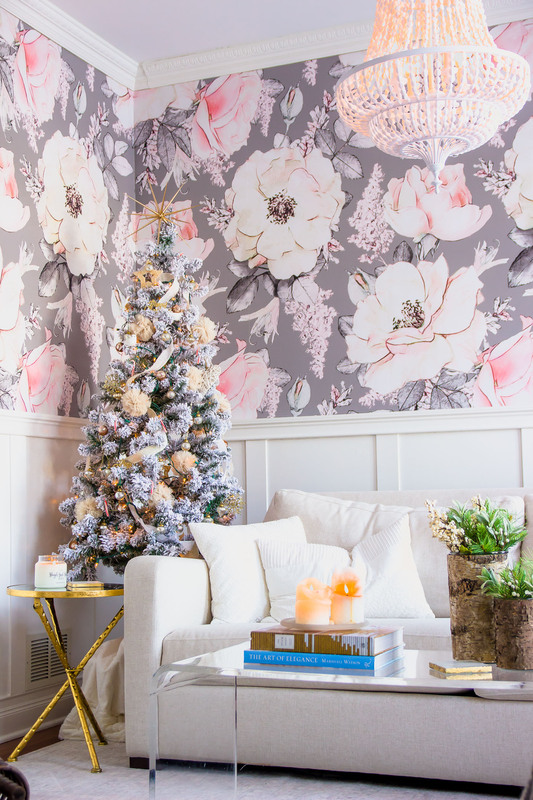 For the holidays, I switch out the florals to either real or faux branches. These X based stools are the best purchase we’ve made all year. We use them all the time as footstools and extra seats by the fire or for guests. Plus they easily tuck under the table. We’re calling this our “flower room” for now! It was our dining room and will probably be our dining room again in the spring. 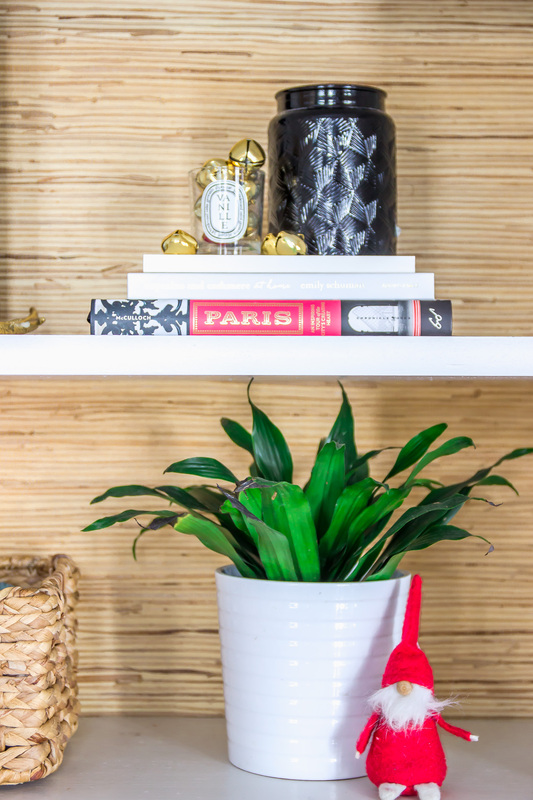 I’m not sure if my husband is totally sold on the wallpaper yet – good thing it is removable! Us girls love it though for now! What do you think? Leave it or switch it up? Last room on this tour is our office / playroom! I’ll link the grasscloth wallpaper and other sources at the bottom of this post too in case your are interested. If you don’t love the stress of wrapping presents right before Christmas, try leaving out wrapping paper where you will see it. Every time you bring home a new gift, wrap it right away and put the recipients name on it right away! I started doing this for everyone (except for the kids) and am thrilled to check that off my list. A few of our family members have seen their wrapped gifts already which is fun cause it keeps them guessing whats inside! 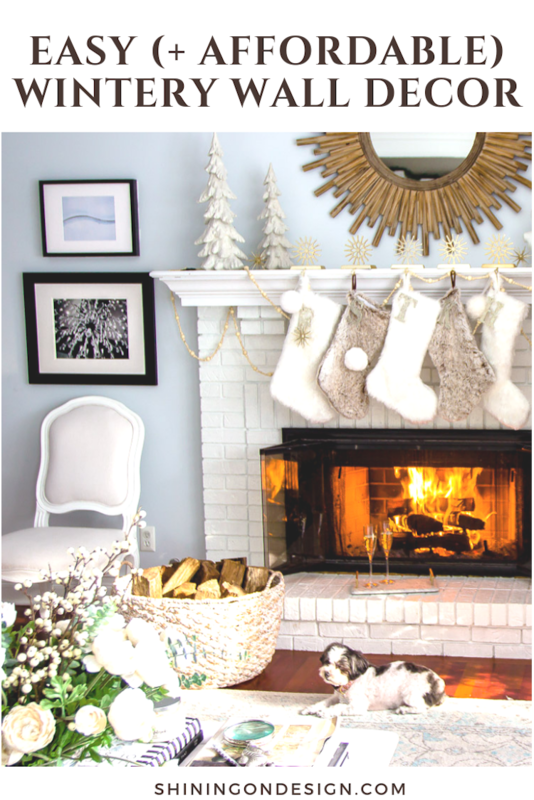 Jingle bells in old candles, a few ornaments and twinkly lights completed the shelves. 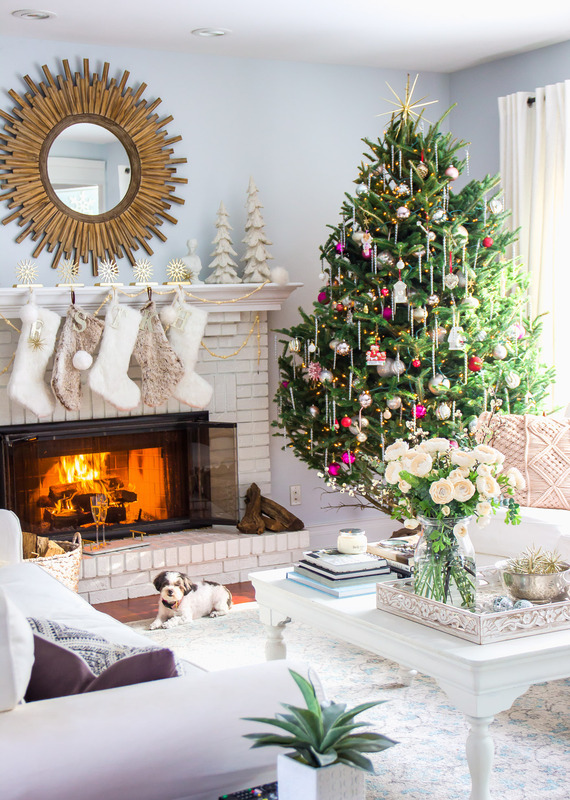 Don’t forget to check out all the inspirational homes on this years blog hop! I promise you’ll want to take notes!! Source list below too! 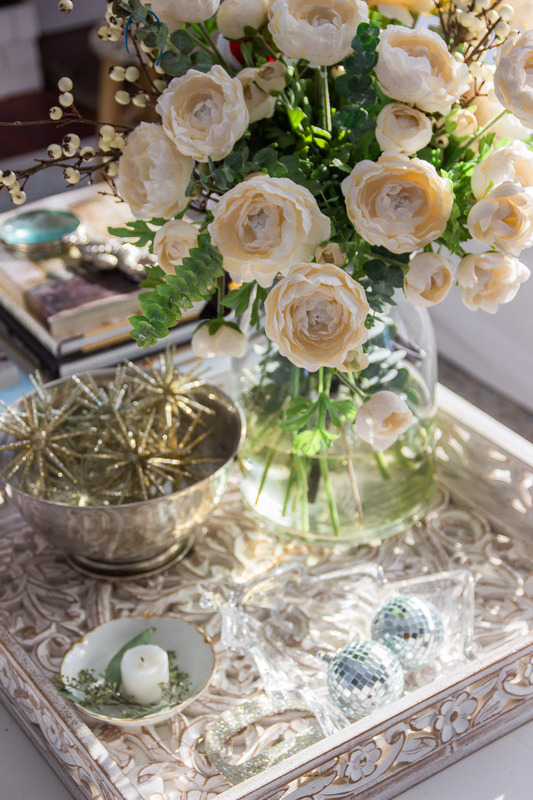 So many beautiful details Samantha! 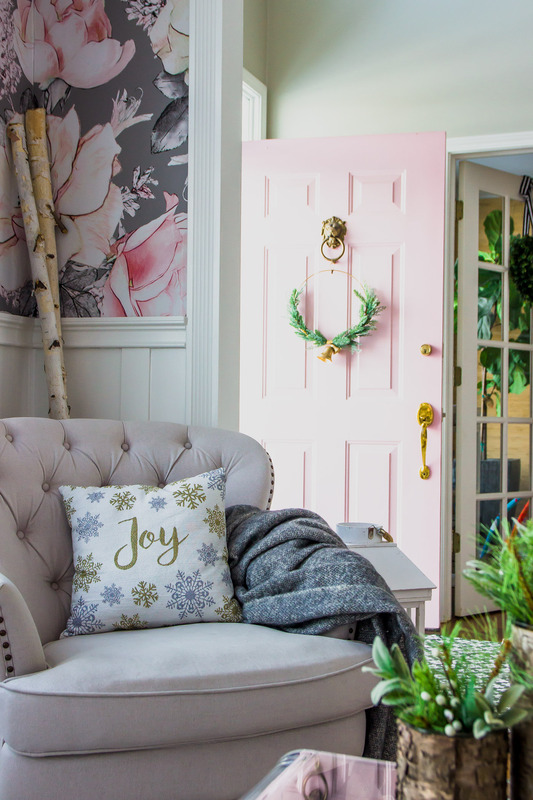 I especially love how you ‘swapped’ out your rooms – the sunroom (now living room) looks uh-maaazing with the two trees, wreaths and other gorgeous details! Bravo friend. Thank you Tana! I love that you did the two trees too!! Gorgeous! Wow! Samantha, I LOVE your trees! 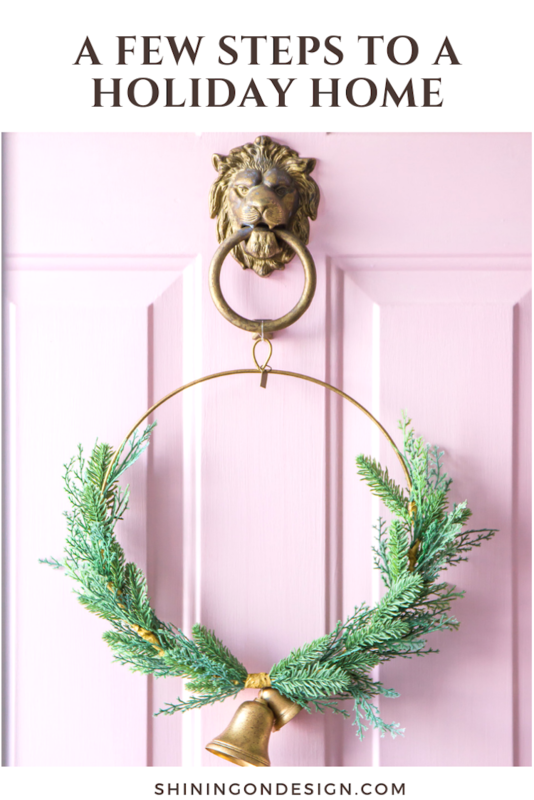 I love the one with the blush tones in your living room….and the one in your dining room with the black touches to go with the black table! …..but your blue dress might be my favorite of all ! Wink Wink! You look as pretty as your decor! Aww thank you!! That means so much coming from you lovely ladies! Thank you Laila! You can never have too many trees, right? 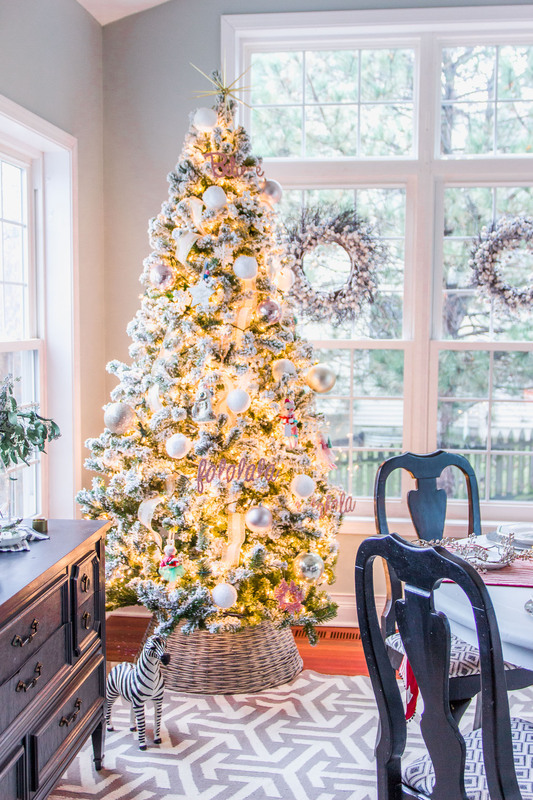 😉 We love our flocked trees but LOVE getting the real deal every year too! Happy Holidays dear! What a stunning holiday home you have! 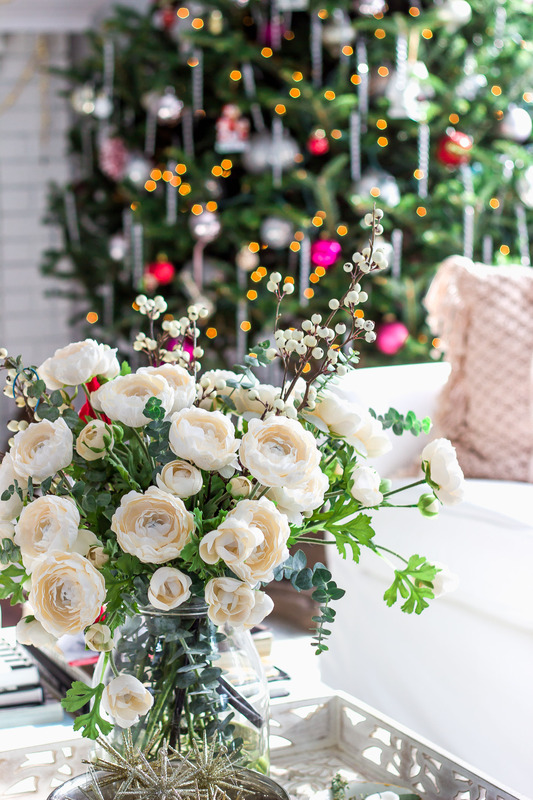 I thoroughly enjoyed reading your post and seeing all your gorgeous decor. Thanks so much for joining us this year on our tour! Happy Holidays! Thank you Janine! I’m honored to be a part of such an amazing group this year for the holiday tours! Always so inspired by your decor! Happy Holidays! Samantha this is just the cutest Christmas tour! And boy do I understand trying to keep a home “blog” worthy while having littles running around! It’s mayhem most days. But your little ladies are just precious and your home is perfectly Christmas. I particularly love the flower room! If I’m having a third boy I’m going to find the most flowery wallpaper i can get my hands on and wallpaper something! So beautiful Samantha ! Your home looks stunning! 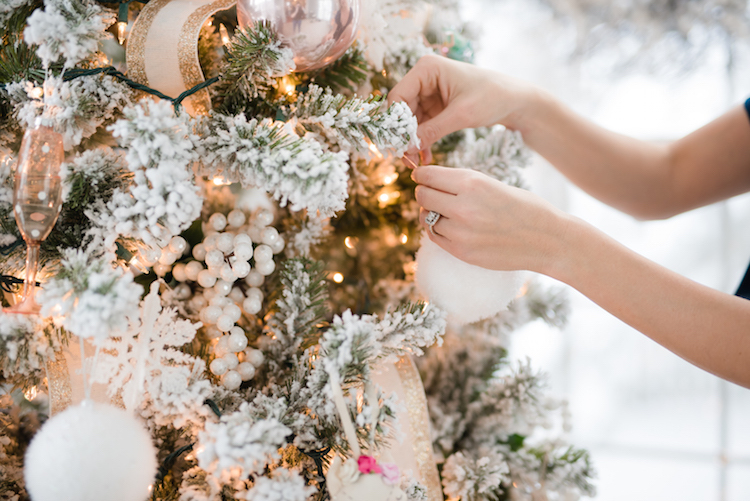 I love all your Christmas touches, your trees are decorated to perfection! 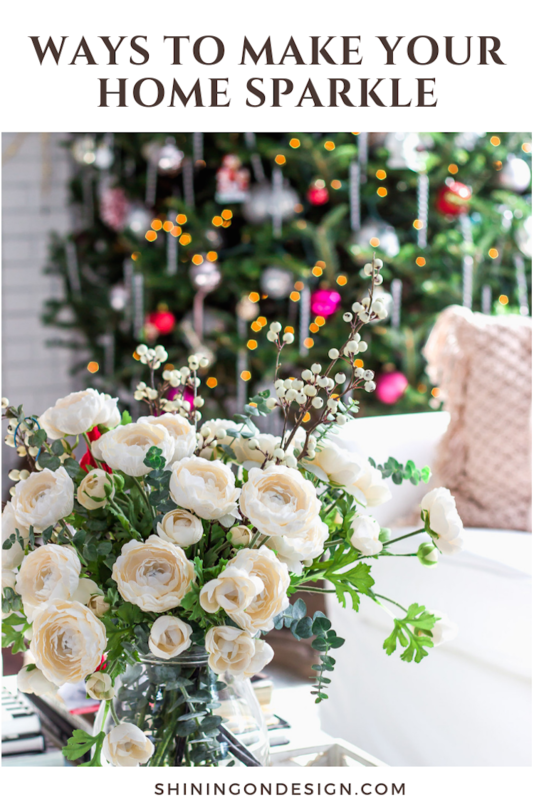 Wishing you and your beautiful family a merry Christmas season!